I am a self proclaimed bat Wh*re. I have just about every senior bat out there. Miken, Worth, Dudley and of course, the melee 12". For my swing, this is my favorite! Unsurpassed distance and a surprisingly large sweet spot for a small barrel. It's not as durable as my Dudley, but for me its worth the compromise. I took off the wrapper and hung the Bat in the dugout. No swings no break in period. I then went up to bat. 4th pitch 330 ft later I had my first hit with that bat. This bat is hot and I do mean hot out of the wrapper. This bat is awesome. I ordered a 25oz. 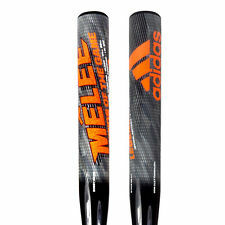 bat which I almost feel has a comparable swing as to a 27oz.balanced Adidas. I like my bat speed.After the break-in period, the balls coming off the bat have super fast velocity, just dangerous .... X-mas 2017 is just around the corner so order one for your senior playing grandpa.